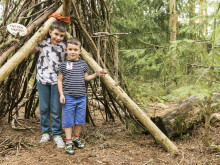 Center Parcs has today launched its new Activity Den across its five Villages, a dedicated children’s destination which has been designed to answer guests' increasing desire for family discovery and adventure. Research conducted by activity specialist In2Action amongst 1,000 Center Parcs guests, revealed that 80% of parents are looking for their family to try something for the first time while on their break and wanted their short break provider to offer the opportunity to give children and families the freedom to have their own adventures. As a result, the Activity Den has been specifically designed to encourage children – and their parents – to try something new together and take home mementos of their stay. The children’s activities for 2-14 year olds include much more theatre and parental involvement, whilst also giving families keepsakes to take home with them. Colin Whaley, Sales & Marketing Director at Center Parcs says: “Families are increasingly wanting to branch out on their break and try things they can’t do at home, so we’ve created the new Activity Den as another way to ensure we’re giving families the freedom and choice to enjoy their own adventures. The new Activity Dens replace the Time Out Clubhouses at all Center Parcs Villages. Enhanced existing activity favourites will still be offered alongside the brand new activities. Center Parcs offers a wide variety of activities for all ages either to enjoy individually or for the whole family to enjoy together. The Company attributes their 27 years of success in the UK to a continually evolving offering to meet modern family needs whilst remaining true to the brand’s core values. 1There are currently five locations across the UK; Woburn Forest (Bedfordshire), Sherwood Forest (Nottinghamshire), Elveden Forest (Suffolk), Longleat Forest (Wiltshire) and Whinfell Forest (Cumbria). Center Parcs is the UK's leading short breaks operator and every year over 1.7 million guests stay at the existing four villages each set in 400 acres of woodland. In summer 2014 Center Parcs Woburn Forest opened, a perfect location for families in London and the South East. There is now a Center Parcs within easy reach of a majority of all UK families. This is an opportunity to bring something new to the Center Parcs family with a number of exciting new concepts. 2 Center Parcs and In2Action survey, 2014. Sample of 1,000 Center Parcs guests. You can feel confident leaving your child in our care, knowing they are in a happy and safe environment. Our experienced staff at our Ofsted-registered Activity Den will encourage each child to learn, develop and investigate in a stimulating environment, while you take some time to explore and make your own discoveries. Who needs a special occasion to enjoy a good party? Whisk your children along to the Activity Den for music, dancing, games and singing. It's a great opportunity for them to make new friends in a safe, supervised environment before leaving with a party bag in hand and a smile on their face. Your little mateys will learn everything there is to know about becoming a pirate or a princess in this three-hour session. Our adventure will be full of games, makeovers, music and creative activities followed by party time and snacks, while parents can relax in the knowledge that children are safe, well cared for and having fun at the Activity Den. Children will become a Center Parcs Woodland Adventurer in this fantastic action-packed activity. 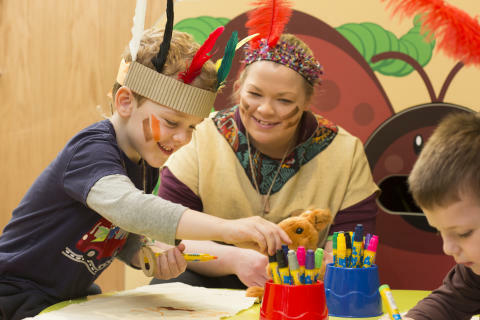 Our tribe will design and make their own woodland headdress, pendants and den before taking part in our specially designed woodland-themed games and activities, all set inside our Activity Den. Parents can relax in the knowledge that children are safe, well cared for and having fun in this three-hour session. Enjoy some quiet time and relax while your budding little chefs and chocolate lovers join us for an adventure at the Center Parcs chocolate factory in this three-hour activity. Little chefs will make their own chef’s apron and hat, create a range of tasty treats and design their own secret recipe as well as playing some chocolate-inspired themed games. Every bear that ever there was is gathering here! Bring your teddy and join in with songs and stories then follow the teddy trail to our Teddy Bears’ Picnic and meet everyone’s favourite bear, Rupert. Each child will receive a new cuddly bear of their own to take home and treasure. Please note that this activity will run indoors unless the weather is suitable for an outdoor picnic. Our creative session is perfect for the whole family as you decorate your own hobby horse. Once your hobby horse is complete you can show it off at the final awards ceremony. Winning rosettes will be awarded for best dressed and best behaved. This session is great fun for the whole family. Create your own unique mini beast mobile and pom pom spider to hang in your child's bedroom. Together with the support and encouragement from our staff, you can be as creative as you like. This nature-themed craft session is fun for all the family and is a great way to fuel little ones' imaginations. Using natural materials, you can create your own family of woodland creatures as well as a habitat home for them to live in, before taking part in our woodland creature activities. Center Parcs has today revealed the activities which will be available at Woburn Forest, the new Center Parcs Village in Bedfordshire when it opens in spring 2014. True to form, Center Parcs will be offering a wide variety of activities to guests, so that families can create their own unique holiday in the forest.